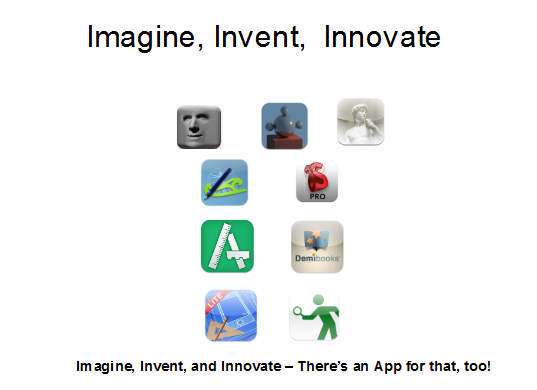 Thank you to my incredible colleagues, Dayle Payne, Rhonda Siemons, and Tony Galle for joining me to offer the Imagine, Invent, and Innovate with iPads presentation at Dynamic Landscape 2012. We shared ways to promote inventive, imaginative, and innovative thinking in Middle School students using tools such as AppCraft (similar to SCRATCH) , 3-D modeling tools (similar to Sketchup), and other apps and practices that promote the creativity cycle, the design cycle, and complex thinking with with i-devices. Here is a playlist of videos and the presentation slides from the sessioin – Imagine, Invent, and Innovate with i-Devices.